Katie Salidas: Sale, Sale, Sale! Did I mention #Sale? Sale, Sale, Sale! Did I mention #Sale? Happy Holidays from Rising Sign Books! We're ending the year off with a HUGE sale! We're selling the remaining stock of Immortalis Series Print edition books for rock bottom prices. 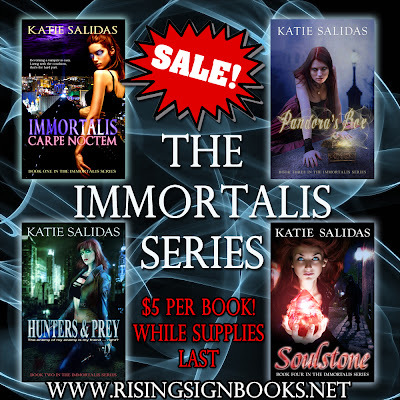 Get Immortalis, Hunters & Prey, Pandora's Box, and Soulstone for $5 each. Pick up the Omnibus for only $15. Give them as gifts! They make great stocking stuffers! We'll even gift wrap them for you. Just let us know at checkout.